On the 1st of July the fifth supervisory audit for compliance with ISO 9001:2008 hold by Slovak “CERT International” certification body was successfully completed in OrexCA.com. It indicates that quality management system constantly develops and improves. That’s why our services are regularly updated and also improved. This year the lead auditor was Mr. Dmitriy Patrushev, head of the QCD/representative of the quality manual JV «Samsun-Tashkent Farm» Co. Among the distinctive features of the corporate management system, which effectively regulate and analyze our employees’ activities, is using of internal software, such as corporate portal Bitrix24 for collective work on tasks, projects and documents, effective internal communications and a number of own software products such as journals for registration discrepancies and work with mistakes, as well as suggestions for improvement. We would like to note the fact that the successful completion of the audit became regularity to OrexCA.com. This success is the result of painstaking collaborative effort of the entire team that never rests on its laurels. We strongly develop our professional skills in accordance with the mission – to be the most fast, convenient and available to respond to our Guests and Partners requests. Tourist stay in a new country should be colorful, impressive and of course as comfortable as possible. Tour program must consider all the details because long trips, unusual climate and most importantly new cuisine may be the reasons of some disadvantages of the journey. Tourist energy supply for each trip and his voyage satisfaction degree directly depend on delicious food that gives everybody strong power. To be confident in the quality of the offered services OrexCA.com representatives regularly taste the dishes in the restaurants where our Guests from abroad usually have breakfast/lunch/dinner/supper. So on June 11, some of our co-workers were invited to the presentation of a new dinner menu for tourists in the restaurant «Turkuaz» at Dedeman Silk Road Tashkent Hotel. This year Job Fair at the Management Development Institute of Singapore in Tashkent, which has been held for the second time, involved about 60 companies and organizations related to different areas of the economy: state, banking and financial sectors, tourism and hospitality management, marketing. 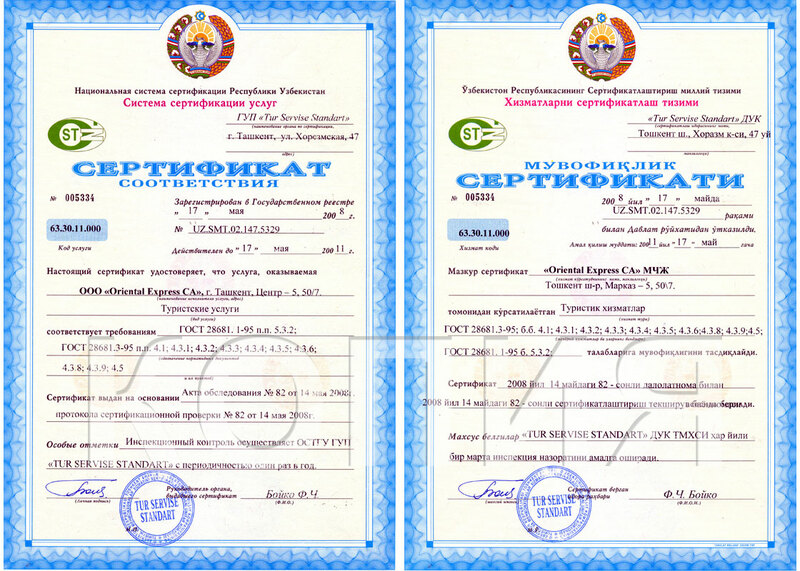 OrexCA.com and OTPUSK.UZ trademarks were also presented at the event. Students are actively interested in the proposed vacancies, answered questions about the main activities of the company, specifics of the work schedule, job duties, working conditions. Then with great pleasure they filled out CV, trying to list all their work skills, abilities and personal qualities. Before the summer holidays people often think where to go on vacation and how to spend it with fun. 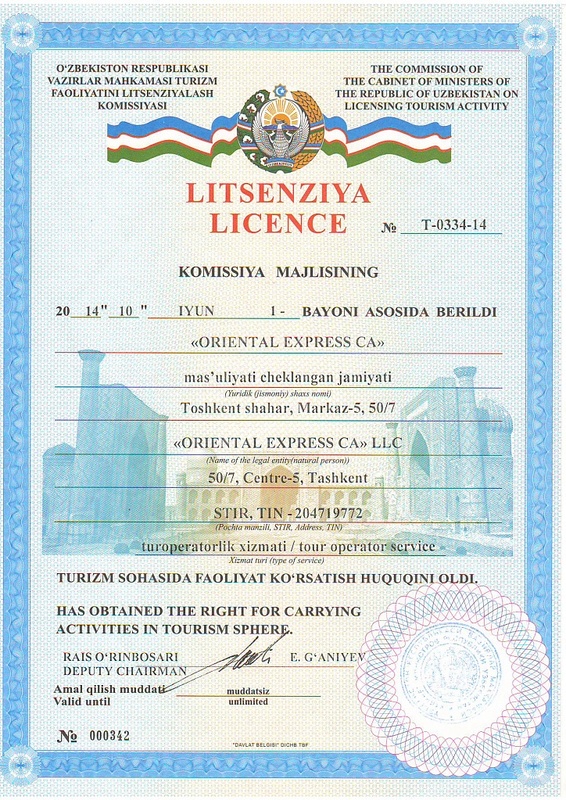 If Internet search engines and your friends’ advices can’t help it’s high time to visit International Uzbek International Tourism Exhibition «The World of Leisure 2014″. It opened its doors on April, 17 in one of the pavilions of the exhibition complex «Uzexpocenter». Over 30 companies took part in it. There were tourism organizations, hotel chains, guest houses, railway and airline companies. OrexCA.com and OTPUSK.UZ representatives were in the thick of things too. From 9th to 11th of April, 2014 OrexCA.com participated at the international exhibition of tourism China Outbound Travel & Tourism Market (COTTM- 2014 ) for the sixth time. This year the stand of Uzbekistan at Beijing China World Trade Center was presented by our travel manager – FIT Lola Bekmuratova. American Chamber of Commerce in Uzbekistan invited representatives of national tourism organizations and hotels for a special meeting, where they could discuss different aspects of tourism development in the country. Being permanent members of the Committee, OrexCA.com representatives also participated in the meeting. The new chairman of the Committee Mr. Shameer Khanal (GIZ) opened the meeting with introductory remarks. Professional activities of OrexCA.com and OTPUSK.UZ staff are directly related to the effective interaction with the Consumer. In sales theory and practice, there are many methods and techniques aimed at increasing their quantity and quality and most importantly mutual understanding between the manager and the Client. It is important not just to know about the existence of such methods, but also skillfully use them in daily work. During last two weeks experienced trainer Alisher Isaev, well-known in Uzbekistan, held a special training in two stages in OTPUSK.UZ office. The purpose of this training is to develop among our employees a clear idea of ​​how to carry out the sale correctly, make constructive dialogue with the Guest and respond to his preferences. What’s the best New Year tradition? Celebrate this magical holiday with your family. OrexCA.com employees are no longer just colleagues but friendly, close-knit team. «I am a part of my company, and the company is a part of me» – this is our one of the most important values. Therefore, the approach of 2014 our team decided to celebrate on December, 27 like at home, gathered after a working day at the dinner table in OTPUSK.UZ office decorated with festive tinsel. Summing up the results of the year in the ceremonial toast, employees repeatedly focused that the central event of the 2013 was the successful passage by a decade. During this period a strong business system and efficient HR-management were found. Now OrexCA.com has a reputation of a reliable partner and service provider. Parting wishes for the coming year – not to stop our achievements, to expand market share, to continuously improve the quality of the service and working conditions in accordance with clearly defined goals and projects. The participants of the seminar gathered to discuss the specifics of tourism development in Central Asia and analyze the needs and expectations of travelers who are interested in this region. The seminar about Sustainable Development of Tourism and Hospitality was held for alumni of SABIT (Special American Business Internship Training Program). It was attended by OrexCA.com Executive Director Leonid Ibragimov. Discussion was led by the professional instructor who works in the tourism industry for 40 years. During it participants could define the concept of sustainable tourism development, undertake analytical work on the creation of new local tourism products and consider the possibility of using different marketing tools to attract tourists and to form individual, corporate hospitality style. Closer to the first anniversary date of our company we actively discussed how to celebrate it so that it would be memorable. After some discussion we almost unanimously decided to leave the city and go to the mountains. Not just to escape from the city noise or to relax after working days but also to work intellectually, to make some plans together and to dream for our important mission that is in the striving to be the fastest, most convenient and accessible travel guide in Central Asia. Our departure was scheduled for 12 pm on Saturday. Loaded hiking backpacks and bags with food our friendly team hit the road. That day the weather was gloomy and it affected the overall mood. But the anticipation of the upcoming celebration made us happy and the whole trip was very funny. After a hearty lunch at «Tian Shan» cafe near Chirchik river we arrived to the final destination – Avenue Park hotel complex, located on the bank of azure Charvar reservoir. There were several hours to the gala dinner. It was almost impossible to keep staying in the stuffy rooms when there were clean mountain air and enchanting landscape outside the window. That’s why we went to see the territory and later visited the warm pool. Gala dinner was prepared with utmost care. We felt special responsibility and pride for this great event. This festive meal in the circle of a cohesive team, united by shared values, mission and vision, is a result of a decade of continuous purposeful work. During this time a solid foundation based on Speed, Convenience and Accessibility has been created. Irrepressible vitality, creativity and understanding became the pillars of everyday activities and success of OrexCA.com. From the 8th to the 10th of October the great attention of the representatives of mass media and business, residents and guests of the capital was attracted to the exhibition complex «Uzexpocenter». Especially the part of it that is very curious and not indifferent to travelling and discovering the world. Where else for a few hours can you take a trip through Europe, travel to the exotic Islands of Southeast Asia or discover other regions of the native country? It will take a lot of time to show the entire geographical coverage of traditional international tourism fair TITF-2013 on the map. Better to see it once! Second Saturday of September OrexCA.com held in accordance with the internal slogan of the year, announced in the company as the «Year of increasing the level of competence of each employee». Success – a team merit! The last weekend of the summer, in anticipation of a hot autumn tourist season, for the entire team of OrexCA.com will not be remembered just as the national holiday – Independence Day of our country, but also as a significant corporate event, dedicated to the team building. On June 18 the leaders of processes of OrexCA.com successfully passed the annual supervisory audit for compliance with ISO 9001:2008 hold by Slovak «CERT International» certification body – our fourth external audit. This year, the lead auditor was Ms. Elena Park, Quality Manager of Carlsberg Uzbekistan, assisted by Mr. Bahadir Khakimov, Quality Manager of «J-United Group Ltd. (trademarks AKFA and Artel). The auditors highlighted the systematic approach to work and the role of information technology even used in regular operations, i.e. our internal softs: «HR Monster» (automated personnel department), «Good News» (the log for a work with discrepancies) «I love improvement» (the log for improvements suggestions) and a number of others. Notable is the fact that the auditors have identified no discrepancies (for the second year! ), and are only recommendations for improvements! This repeated success – another step in the continuous improvement of quality management system of our services to meet and anticipate the needs of our esteemed Guests and Partners.